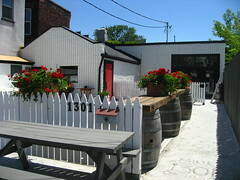 Patio out front and the red door leads to the interior. Ceili Cottage (pronnounced kay-lee) is the newest venture (opened last week) by Starfish owner Patrick McMurray. While this had been on the radar, it wasn’t until the website had coughed up a menu that a dinner visit was decided upon. I was charmed by the oyster shells embedded in the concrete path leading to a bright red door framed by a gleaming white building. A rustic interior greeted us as we entered and we found our way to the back area where the bar was set. Drinks in hand, we settled into our stools and joined others at the black stone bar for a casual evening. 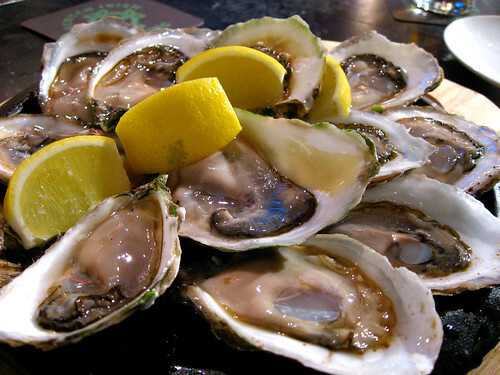 Of course, raw oysters were a must. They only had Malpeques that night. 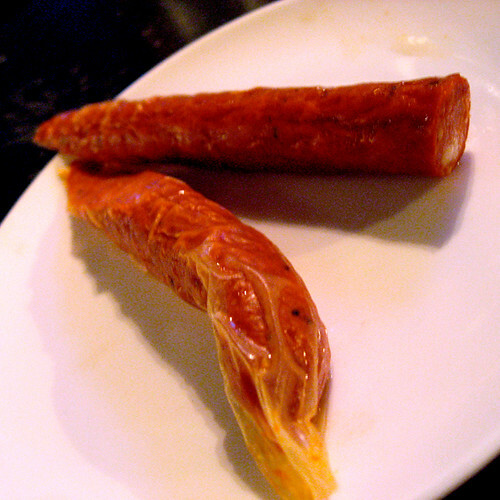 Pickled sausage. Spicy, with a too-loose casing. From their interesting snacks menu that I'll have to work my way through. 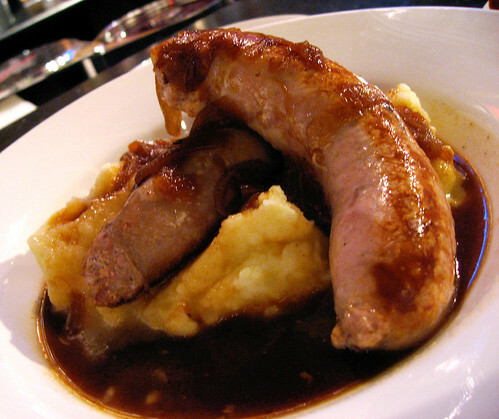 Bangers and Mash, a traditional dish. Comfort food indeed. 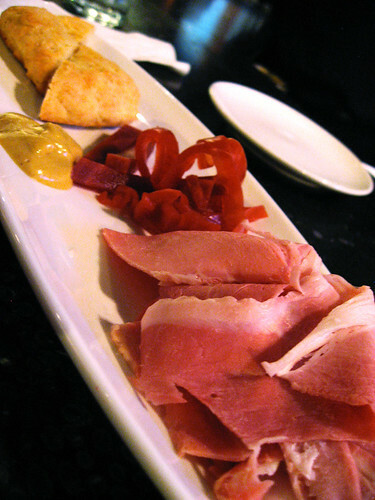 Berkshire ham with soda scone, hot mustard, and pickled veg. 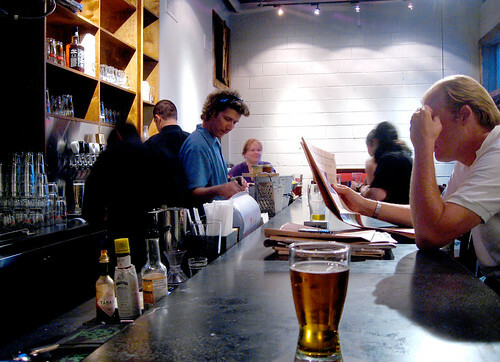 An above-average take on bar fare. Ham was quite nice, as were the pickled veg. Scone had a nice crumble to it. 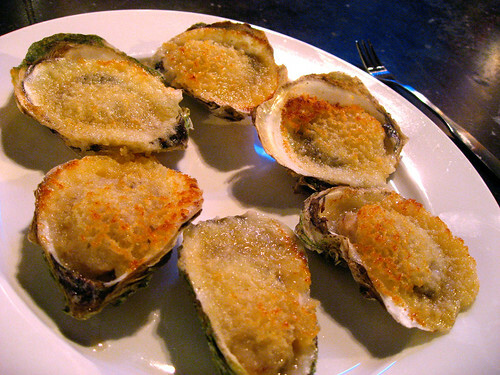 Baked oysters with garlic, butter and panko. Great textures - salty, sweet, crunchy, creamy. A definite re-order when they get the larger oysters in. 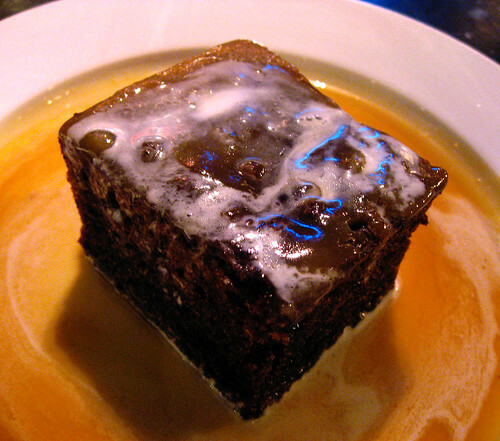 For dessert, sticky toffee pudding. Not as heavy as I'd have thought it to be, the warmed spiced cake was laced with a lovely date flavour. One downside to visiting so soon after they’d opened is that the service and kitchens are very very slow as the new staff is learning. So don’t go if you’re starving, in a rush, or don’t have time to kick back and enjoy the convivial atmosphere. A paper or magazine would not be amiss. Also, at 11pm the place gets packed, as outside patrons must vacate the patio and come inside due to a city by-law. Looking forward to future visits, as the menu lists quite a few interesting things. Of note, their daily special involves a roast that is cooked on Sunday and then the meat is then used throughout the week in various ways. I’d joked about returning for a week straight to catch the progression of dishes. At least, I think I was joking. Overall, the combination of a relaxed vibe and satisfying food already shows much promise. The fact that it’s open late (and that their kitchens serve until close!) is a huge bonus. Once they work out the new-opening kinks this will definitely be a place to add to the go-to list. Great pics- will have to check this place out sometime soon! as usual, the photos are excellent! they are professional without looking staged, shows your talent as well food plated for the “regular” diners. when you go to write a story, do they know? lots of people take food pics now, so i wonder how that factors into service. do you know before hand which restaurants you’ll cover? or do you select among the best experiences/photos? phoenikia > I really think you’ll like it. It’s such a nice neighbourhood-chill type place. Vanessa > I dunno. I’ve taken photos for the last umpteen years and it was weirder when I started. I don’t mention I blog unless they ask and I never know what I’ll cover – I just have my camera with me all the time. Usually, if we’d had a really good experience, we’ll write about it, even if the photos didn’t turn out. Good photos are nice, but if we’ve nothing to say about it, I’ll just leave it to flickr. guys and gals, come on and let’s be fair. You can’t objectively review a place when it has open so soon. I know we all want to be “FIRST” in line to cover a new place because toronto has a vast amount of blogs and sites so there’s always a race to get to the new place. But imo it just isn’t fair to be talking about a place when the kinks haven’t been ironed out. This review is both damaging and unfair. “Lets be fair“. I totally agree. And as you’ll see if you look around our site, we don’t write reviews, and this post is no exception. It’s silly to read a post with a few pictures and think “oh my goodness, review!!!”. Not every mention of a restaurant is a “review”. if one of us goes to a new restaurant, it’s because we’re excited about something new in the Toronto scene. If we make a post about it, it’s because we want to share our experience with others. Neither of us has any interest in assigning some meaningless star rating to a restaurant, whether it’s been open a week or a year. also, as I pointed out elsewhere, you can’t actually objectively review a place at any time. you’re the one looking at them on our website. Keep it up! I understand the point you’re trying to make about the excitement and rush of a new experience. But on the flipside, have you considered that most (90%) restaurants need to find a groove before they’ve worked out the kinks? It’s wholly unfair on even a business level to be judging them based on those errors. Every restaurant on the planet has made a few mistakes on their opening day. If all of us visited that restaurant on teh first day and reported on the mistakes, we’d kill the industry. you can’t be 100% objective but there is a balance. Let’s be fair > Clearly I’m cognizant of restaurants making mistakes early on. It’s why I specifically stated “Once they work out the new-opening kinks this will definitely be a place to add to the go-to list.” and even then, I wrote again elsewhere in the post that I wanted to go back – even possibly for seven consecutive days! Far kinder than those who were unprepared for the wait on places like Chowhound. In fact, two weeks later and they were still having service issues according to Chow. So this goes beyond just “opening day.” That’s a long time to not correct things in the service industry. Basically, anyone who read what I posted would have gone knowing that Ceili Cottage was a positive experience but newly opened and still working things out. And that I would certainly return. I wanted potential patrons to go prepared for a wait and not be disappointed. Better, I think, than the Globe and Mail review. They published on the 4th of July I think, (edited since) and would certainly have visited a day after me at best. It too, was a positive review with caveats, but no mention of it being just opened, so it doesn’t even give the reader that clue of why things might not be smoothly running, especially when a reader goes for a visit in the week after the review. A disservice, indeed. I’m a bit surprised at the comments. I got to this blog looking for pics and a writeup on Harlem (where I decided to go tonight) and had already decided to go visit Ceili based on the above post. It was only on second visit that I caught the comments. Still going to Ceili tomorrow and will definitely read this blog regularly for new suggestions. Great spot! Fun owner, Terrific chef!